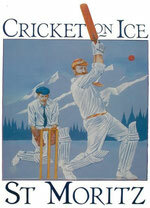 Cricket on Ice 2015 will take place from Thursday 19th to Saturday 21st February 2015. The date was confirmed to St Moritz Cricket Club by See-Infra, the organisation responsible for all sporting events on the lake at St Moritz. St Moritz Cricket Club will now be accepting invitations from clubs & individuals wishing to compete in the event next winter.